The Greek crisis is compromising currency traders’ reputation for being the first and fastest to react to big economic or political news. The prices of southern euro zone government bonds and of European equities have fallen since European politicians began to talk openly about the possibility that Greece might default or even leave the euro. Yet, at $1.1370, the euro is trading closer to the top than the bottom of its three-month range against the dollar. What is going on? FX traders can defend themselves by saying that currency options point to underlying pessimism about the single currency’s prospects. But that fails to explain why the gloom is not showing up in the spot market. One problem is that exchange rates are always two-sided. So, the euro/dollar also reflects what Federal Reserve Chair Janet Yellen is going to do, and when. Bond yield spreads and stock prices can be a purer expression of investors’ concern about the threat to a monetary union which was supposed to be irreversible. Also, hedging flows are sometimes making the euro move in counter-intuitive ways. Many foreign investors who bought euro zone stocks and bonds earlier this year hedged their exposure to the single currency, which they anticipated would fall. When asset managers scale back on their investments, or the price of these assets fall, some of these hedges are unwound – by buying euros. That pushes up the exchange rate. Finally, uncertainty is keeping traders from placing big bets against the euro. European creditors might cut Athens more slack at the last minute. Even if they don’t and Greece leaves the euro zone, remaining members could pool more sovereignty, strengthening the foundations of the single currency. In the fog of ignorance, speculative players are sitting still. This leaves the euro at liberty to benefit from the buoyant effects of the region’s current account surplus. 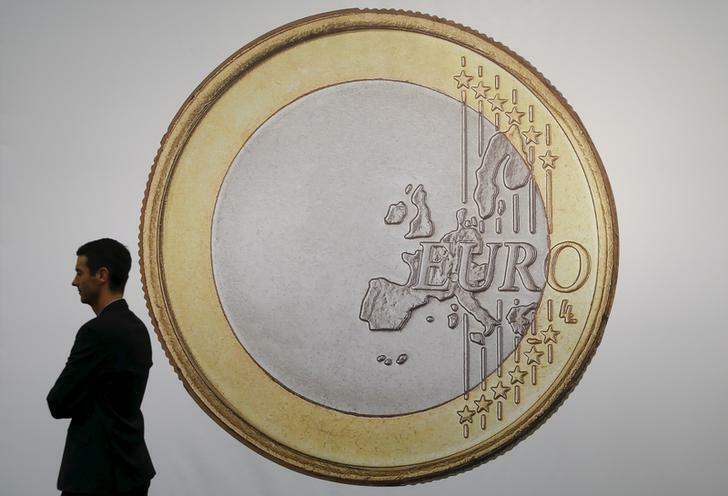 The euro’s resilience could crumble if Greece steps too much closer to the brink. But even then, the bond and stock markets are likely to be a better guide to how investors view the single currency project. A man stands in front of "SUPERFLEX, Euro 2012" , a 416.6 cm by 289.6 cm (164 by 114 inch) large photographic print of an Euro coin on sale by the Los Angeles-based gallery 1301 PE at the Art Cologne 2015 fair in Cologne April 15, 2015. The euro was trading at $1.1370 at 0730 GMT on June 22. In the past three months, it has traded between $1.0520 and $1.1468.